Available Real Estate is a full service commercial real estate brokerage firm in Jacksonville, Florida. 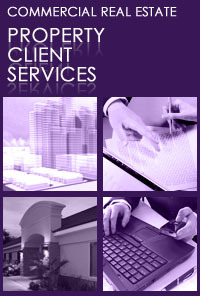 We provide Commercial Real Estate Services and Commercial Real Estate Development Services. Available Real Estate has a well rounded team of professionals with exceptional skills and broad experience. We analyze projects, develop action plans and work on transactions collectively. Consider us your source for commercial real estate information and service in Northeast Florida. Our sales and leasing specialists work closely with real estate owners and investors to develop and manage customized programs that focus on cost-efficient operations and tenant retention. Our proven programs and processes have enhanced property values for our clients. Available Real Estate's expertise ranges from prestigious office properties to retail, industrial, and wharehouse properties. With a focus on Commercial Lease negotiations in the State of Florida, we understand that negotiating the right Commercial Lease is a lot of work and can be at the very least, confusing. Available Real Estate is here to help you. Available Real Estate professionals have the skills and background to help you think through critical issues and create detailed real estate strategies that complement your business goals. We can assist you from the initial stages of procuring the land, to obtaining all necessary permits and zoning requirements for your project. In some instance we may have an inventory of land that is already zoned for commercial development. Our land acquisition services will assist you in finding the raw land that is right for your project and how to maximize your real estate acquisition. Armed with unparalleled market data and industry relationships, we help you find space that meets your business goals and financial objectives. Available Real Estate advises real estate users on the relocation and expansion of their operations, disposition and renegotiation of their leases, and strategic planning for their space needs. Our professionals can guide you through the space procurement process every step of the way. Available Real Estate is eminently qualified to represent your interests, whatever the task—from managing the leasing of a property, to full property and asset management, to construction services. In keeping with your stated objectives, we evaluate market conditions, assess current trends, and perform competitive analysis to position your property for optimum tenancy. We develop strategies that position and market your offerings to the most demographically precise audience and we reach that audience through the targeted use of the media.